Beach San Diego - It's all about the beaches in San Diego, isn't it? At least on most vacations, beaches still rank tops for tourists coming to San Diego. There are plenty of beaches for San Diego to celebrate--and best of all-- there are plenty of hotels, as well. There are approx. 70 miles of beaches in San Diego in both the city and county. Vacationers consistently choose San Diego as their favorite vacation spots because of the weather, manmade islands and hotels at the beach. If you are seeking a sunny, warm clime, you best head for San Diego. It offers the finest temperatures of any U.S. city. And in a recent poll during the Labor Day (September) holiday weekend, the nation and Californians chose San Diego as one of the very top places to visit. San Diego hotels are numbered over 100. With city by the bay offering the nation's finest weather, world-class attractions and a variety of unique accommodations, this is truly the vacationer's paradise. From Coronado Island, Imperial Beach, Mission Bay, Mission Beach, Pacific Beach, Ocean Beach and La Jolla to San Diego Zoo or Wild Animal Park, you can stay a week in San Diego and never run out of things to see and do. For starters, there's SeaWorld, Legoland, Balboa Park, Old Town, Point Loma, Belmont Park, Tijuana, Gaslamp Quarter, Horton Plaza, Seaport Village, thoroughbred racing at Del Mar and gaming casinos. Once you visit this wonderland of sunshine and fun, you'll want to return again and again. San Diego offers something for every age group and interest. Families, business travelers and meeting planners can choose over 200 hotels, thousands of rooms and suites and room rates to compete with any location along the California Coast. Resorts such as San Diego Hilton Resort or Catamaran Resort Hotel feature beaches on site, boat docks with yachts, paved jogging and bike trails along the waterfront. These properties are especially nice for family vacations. Hotels and resort options are one of the many things to love about San Diego. The beaches are friendly and fun. Unlike Orange and Los Angeles Counties to the north, San Diego permits consumption of alcoholic beverages on its beaches for those of legal drinking age. The beaches are open nearly all the time and make San Diego Beaches the #1 choice for guests. Getting around: An affordable public transportation system allows guests to visit the entire San Diego County coast without having to drive a car. There's San Diego International Airport, Amtrak and Coaster trains, Metropolitan Transit System trolley rides, buses, ferry boats and pleasure cruise ships that transport guests in and out of the city. While San Diego is one of the easiest regions to drive around, the public transportation system features relaxing rides and beautiful scenery that can only be enjoyed as a passenger. 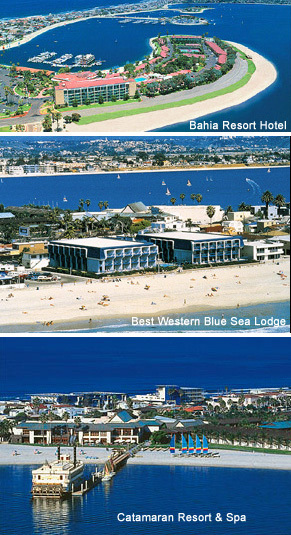 San Diego hotels and resorts offer so many choices that your best bet is to explore and try them. Some facts: 9 hotels feature golf, 15 have tennis, 42 take pets, 14 offer child care, 70 have restaurants on site and 125 have swimming pools. Tested and enjoyed, the properties featured offer ocean or bay views, Catamaran sailboat rentals, bay cruises, sand beaches on site, swimming pools, rooms and suites with balconies, restaurants on site, bicycle rentals, gift shops and special surprises. At the Hilton, there are putting greens, bonfire pits and SeaWorld fireworks visible many nights; the Catamaran Resort, decorated with tiki torches, koi ponds, waterfalls and an aviary with exotic birds, offers complimentary cruises on a sternwheeler boat; Loew's utilizes feng shui throughout the property for positive flow of energy and features Gondolas for a romantic cruise, buses that come to the hotel door to take you to the Ferry Landing and suites with spectacular "city lights" views of San Diego.